Emphysema is a progressive, long-term lung disease included under chronic obstructive pulmonary disease (COPD), which are obstructive lung diseases characterized by increasing breathlessness. In the case of emphysema, it occurs when the alveoli, or tiny air sacs in the lungs, sustain damage that causes them to lose their natural elasticity. Centrilobular emphysema — The most common type of emphysema in smokers, this largely affects the upper lobes of the lungs. Paraseptal emphysema — This type of emphysema refers to emphysema of the distal airways and alveolar sacs close to the lungs’ outer boundaries. Panlobular emphysema — A combination of centrilobular and paraseptal emphysema, this is when the areas associated with the two conditions are affected. Cigarette smoking is the primary cause of emphysema, and is believed to be responsible for as many as 85 percent of emphysema and COPD cases. Even exposure to passive cigarette smoke can make an individual more prone to developing emphysema, although actually smoking cigarettes remains the greater risk factor. This is because cigarette smoking destroys lung tissue and inflames and irritates the airways, all of which contribute to air flow obstruction. Because emphysema progresses slowly, most people with this condition will display few, if any, symptoms. 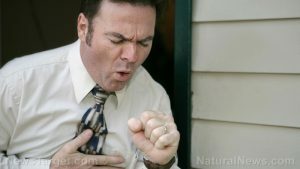 But as the disease worsens, the affected indivdual will feel a chronic cough and shortness of breath, which are the two key symptoms of emphysema. During the earlier stages of emphysema, these symptoms will only manifest at times of severe physical exertion, though they can happen during rest as well. In general, emphysema affects the respiratory system. As this condition grows progressively worse, it can give rise to several respiratory-related complications such as pneumonia and collapsed lung. Moreover, emphysema can also put a person at higher risk of heart problems. No single food can prevent emphysema, though there are several that may help alleviate its symptoms. Garlic, for instance, can liquify mucus to prevent congestion. A daily cup of rose hips tea will exercise a similar decongestant effect. Medications — In some cases, a doctor will prescribe medication to provide relief from the symptoms of emphysema. Bronchodilators are medicines that open up the airways, while corticosteroids help eliminate inflammation. Oxygen therapy — When independent breathing becomes too difficult, oxygen therapy is the next step. Liquid oxygen systems, compressed gas cylinders, and electrically driven oxygen concentrators are just some of the available oxygen therapy options for emphysema sufferers. Pulmonary rehabilitation — This program aims to improve the life of emphysema patients by making them quit smoking and embrace a healthier lifestyle. This would entail following healthy diet, getting more exercise, and drinking plenty of water. Surgery — Damaged lung tissue can be removed through surgery to enhance diaphragm function. For some people, however, lung transplantation will be necessary, though this is most often reserved for those with severe emphysema. Emphysema is a lung disease wherein the air sacs of the lungs are damaged, making it more difficult to breath. A person who has emphysema will usually experience a chronic cough and shortness, as well as other symptoms like fatigue and morning headaches. Emphysema is primarily caused by smoking, but breathing in secondhand cigarette smoke and exposure to respiratory irritants can give way to this condition too. While there is no cure for emphysema, it is a preventable condition. The best way to avoid it is to quit smoking and adhere to a healthy lifestyle.